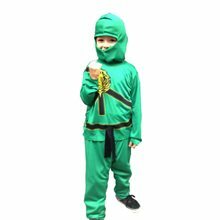 Black Ninja Ninjago Avengers Child's Costume Includes: Face Scarf, Pants, Sash, Shirt w/ Attached Hood. Black. (Sword/Boots Not Included).Shirt: Slinky Knit Fabric with Elastic Cuffs and Ties at Wrist, Slit Neckine with Ties, Attached Hood; Pants: Slinky Knit Pants w/ Elastic Waist and Cuffs, Ties at Ankle; Length of Fabric Ties for Face Scarf and Waist Sash. 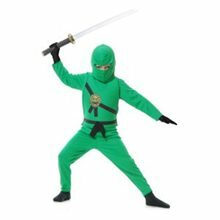 Green Ninja Avengers Child's Costume Includes: Face Scarf, Pants, Sash, Shirt w/ Attached Hood. Green. 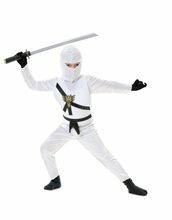 (Sword/Boots Not Included).Shirt: Slinky Knit Fabric with Elastic Cuffs and Ties at Wrist, Slit Neckine with Ties, Attached Hood; Pants: Slinky Knit Pants w/ Elastic Waist and Cuffs, Ties at Ankle; Length of Fabric Ties for Face Scarf and Waist Sash. 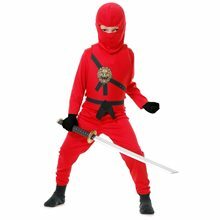 Red Ninja Avengers Child's Costume Includes - Hooded Top pants Foamed Armor Face scarf sash Other items sold separately .